Season your meals at the push of a button with Salter's Stainless Steel Electronic Mills. Add a touch of luxury and convenience to every home meal. Grind salt and pepper effortlessly for superior seasoning. A grinding mill is one of the most commonly used kitchen accessories, and salter's electronic option isw so easy to use that you only need one hand! Designed with clear acrylic and stainless steel, these sleek mills look right at home in any kitchen. You can easily see the fill level and spot when the mills need re-filling. Simply remove the top, fill with your desired seasoning and spice up your life! 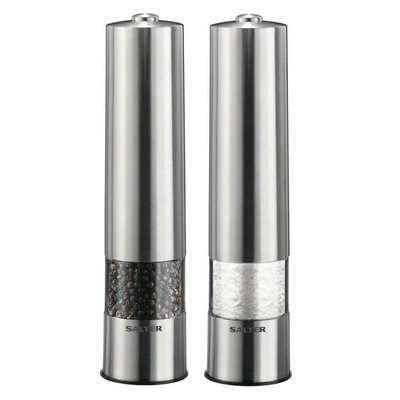 The universal ceramic mechanism is suitable for salt and pepper to give you superior seasoning. Featuring an adjustable grind, you can twist the sides to change the size of your seasoning to get fine or coarse pepper/salt. Designed with a light at the base, this nifty gadget illuminates your food as you season! The ideal mood lighting for an evening meal. The mills have base caps secured to ensure the mills are sealed off when not in use, it's the best way to make sure you get freshly ground pepper or salt on your food! A great gift for a friend or even yourself! These stylish salt and pepper mills are a modern take on the classic kitchen accessory and simple to use. Streamline your seasoning experience with these electric mills and get grinding!